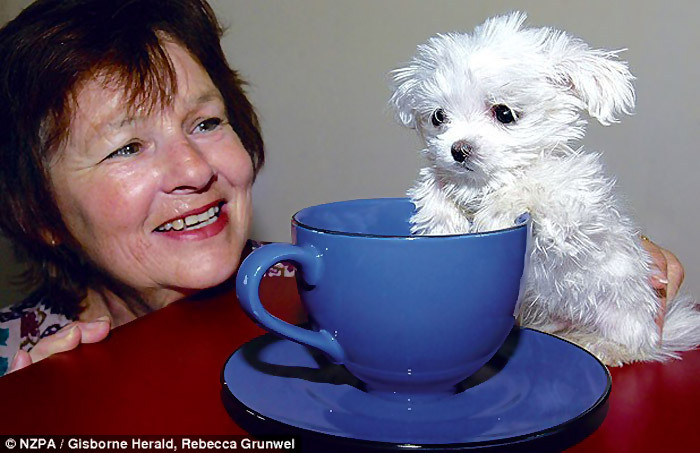 A Tea Cup is like a nickname for all Maltese Puppies but this one is really big as tea cup! His name is Scooter and is tall only 3 inches (8 cm) almost one inch less than the current small dog recorder Boo Boo (Boo Boo is a long-haired chihuahua living in the US and have 10 inches), and can sit comfortably in a tea cup. “Scooter is so small he can sit in one of the tea cups I use” said the owner Miss McKnight. Having the six-month-old Scooter at home is “almost” like having any other dog except he can’t eat from a normal dog-sized bowl, he eats out of an egg cup; you can put a leash on him and take him walk because there isn’t any leash small enough to fit him; he can’t go across steps; you must protect him from cats if you have at home; and you must be very careful not to step him.